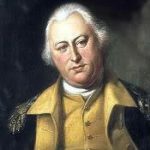 Two weeks later, at a farewell dinner for General Anthony Wayne, Judge Symmes confronted his new son-in-law for the first time since their wedding. Addressing him sternly, he demanded to know how Harrison intended to support his daughter. However, the bride’s father eventually came to admire his son-in-law. The first Harrison child was born the next year at their cabin near Cincinnati. 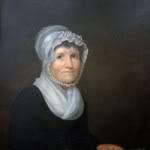 While her husband’s career progressed from garrison commander to congressional delegate from the Ohio Territory, Anna gave birth to ten children (including one who died at age three) between 1796 and 1814, and took primary responsibility for their upbringing. Harrison’s service in Congress as territorial delegate from the Ohio Territory gave Anna and their two children a chance to visit his family at Berkeley, their plantation on the James River in Virginia. Their third child was born on that trip, at Richmond in September 1800. Despite her privileged childhood, she adapted well to frontier life while her husband served as first governor of the Indiana Territory (1800–1812). 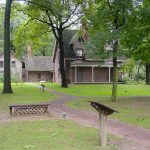 They built a three-story brick home at Vincennes, a combination fortress and plantation mansion, with slits in the walls for rifle barrels and a ready supply of gunpowder in the basement. There in the home they called Grouseland, Anna was to live for eleven years. 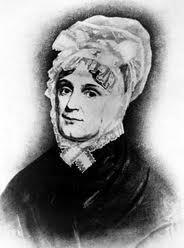 Anna Harrison managed her various roles; a mother responsible for the education and religious training of her growing family that would eventually number ten children; hostess at the governor’s house to prominent visitors like Vice President Aaron Burr and Indian leaders Tecumseh and Tenskwatawa; financial management of her and her husband’s property, other assets and debts. With the War of 1812, Anna took her children back to North Bend, Ohio, where there was less chance of danger. Upon her father’s death in 1814, she inherited Judge Symmes’ substantial land holdings, but also his great debts. The Harrisons enlarged their cabin into a sprawling 22-room house. Though not as elegant as Grouseland it was the home Anna would occupy for many years to come. Despite Harrison’s subsequent election to the U.S. House and then Senate, and his appointment as Minister to Columbia, Anna remained in Ohio while he was away in Washington and then Bogota. She was well-read and actively interested in the political world in which her husband now moved, avidly consuming all the political journals and newspapers she was able to obtain on the frontier. Meanwhile, the Harrison children were becoming adults and the expense of educating and marrying their children placed such a heavy financial burden on their parents that they had to mortgage some of their property. They lost eight of their adult children – five in the 1820s and 1830s, and three more in the 1840s. In 1825 Harrison was elected to the U.S. Senate, where his popularity and his attempts to introduce legislation benefiting the military irritated some colleagues. Anna remained at home, and now had become worried about two of her sons – one had become an alcoholic and could no longer support his family and the other was deeply in debt. Now age 60, Harrison’s health was declining, so Anna was shocked and puzzled when he was named as the Whig candidate for president in 1836. To her relief Martin Van Buren defeated him. For the next few years the Harrisons enjoyed a peaceful life surrounded by children, grandchildren and many visitors. After the death of their son Benjamin in June 1840, Anna became ill and the constant flow of visitors left her little time to recover. When President Harrison left for his inauguration in Washington, DC, in 1841, Anna decided to stay home until spring. It was a long and difficult trip even by steamboat and railroad, especially for a woman of 65, and February weather was uncertain at best. The Harrisons asked their daughter-in-law Jane Irwin Harrison, widow of their son William Henry, to accompany the President to Washington, DC, and to perform the duties of first lady until Anna’s proposed arrival in May. Half a dozen other relatives happily went with them. A cold wind was blowing at the inaugural on March 4 and President Harrison spoke for nearly two hours, wearing no gloves or hat. Because of his advanced age and with his resistance being lowered by hard work and many visitors, he caught pneumonia. William Henry Harrison died April 4, 1841, exactly one month after his inauguration, the first president to die in office. As Anna was preparing for the move to the White House a courier arrived with the shocking news of the President Harrison’s death. Anna remained in Ohio since she would not have arrived in time for the state funeral. The president was buried in the Congressional Cemetery in Washington. Accepting grief with admirable dignity, Anna selected a site on a knoll near Congress Green Cemetery in North Bend, where her father was buried, and began construction of a final burial place for her husband. A few years later, Harrison’s remains were brought home and placed in the tomb there. Within four years of her husband’s death, Anna also lost her three remaining daughters. Although William Henry Harrison had served only one month in office, in June 1841 Congress voted to give Anna a pension – a lump sum of $25,000 – and free postage on all her outgoing correspondence. She was the first presidential widow to be awarded a pension. She still faced a bleak and lonely widowhood due to the debts left by her husband and children. In 1858 Anna’s house at “The Bend” burned to the ground, and the property was sold. Anna lived the remaining years of her life with her son John Scott Harrison, the only one of her children to outlive her. Anna helped raise his children, including Benjamin Harrison who later became President of the United States. Anna was strongly opposed to slavery, and as the Civil War approached she encouraged her grandsons to fight for the Union. 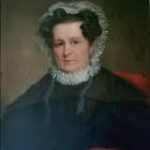 Anna Harrison died at the North Bend home of her son, Ohio Congressman John Scott Harrison on February 25, 1864, at age 88, outliving her husband by twenty two years. She was buried at the William Henry Harrison Tomb State Memorial in North Bend, Ohio. The tomb fell into neglect after her death and the family deeded it to the state of Ohio. The state erected an imposing monument over the tomb and now maintains the site. Other than the tomb, nothing physical remains in North Bend, the town founded by Anna’s father. Today a golf course surrounds the burial site where the foundations of many buildings are still visible.